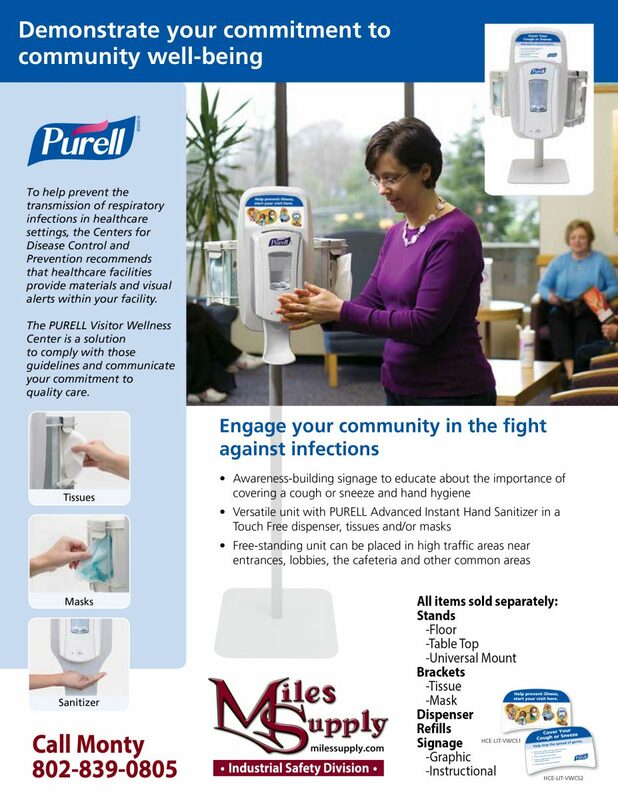 The Purell Instant Hand Sanitizer in the Purell Visitor Wellness Center can help you demonstrate your commitment to community well-being. The Purell Visitor Wellness Center is a solution to comply with healthcare guidelines and communicate your commitment to quality care. Purell Instant Hand Sanitizer refills, dispenser, and stands. Help prevent the transmission of respiratory infections in healthcare and public settings; the CDC recommends that healthcare facilities provide material and visual alerts within their facilities. The Purell Instant Hand Sanitizer is a solution to comply with those guidelines and communicate your commitment to quality care. This is just one of the products where we could ask the question “Where would I buy this?” and that’s where we suggest that you have a conversation about your needs with Monty. “Shopping” at a one stop shop like Miles Supply can really free up time with purchasing and paying invoices. Call Monty at our Barre location: 800-396-8049, at his cell phone in the picture above, or mention Monty in your request for a quote.